Animas / Medtronic Pump Information | Life, Sport and Diabetes - An everyday look at my life with type 1 diabetes. With the news of Animas sadly discontinuing their insulin pump manufacturing in the UK, there has been a lot of conflicting information flying around about what might happen next. Hopefully this blog will answer a few of the questions and perhaps help point people in the right direction. As I understand the transition process, people are being transitioned over to Medtronic for support with supplies etc in the interim and then when the 4 year pump contracts expire, will have the opportunity to change pumps. Obviously I had no idea that Animas would be discontinuing their pumps back then, but two and a half years ago I made the transition from the old Animas 2020 pump (the vibe didn't work for me) to the Medtronic 640g without any problems. The biggest point of difference in getting to know the new pump was learning to get to grips with the Enlite sensors and continuous glucose monitoring which didn't take long at all. 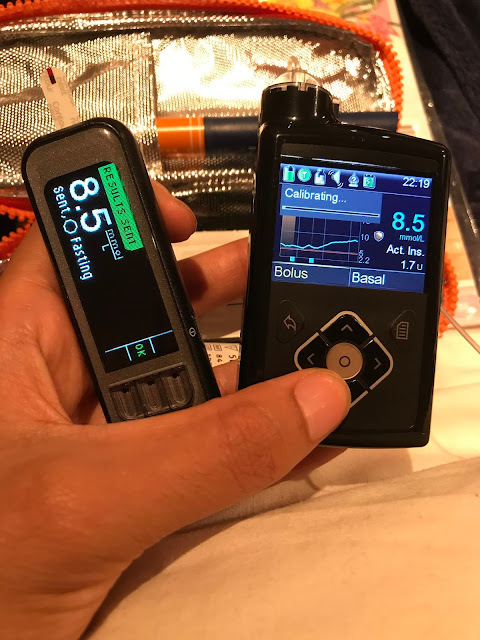 Another point of difference was that the Animas pumps had an audio bolus feature, which I found helpful- where you could press a button without needing to see the pump and tell it to give insulin. However, with the Medtronic 640g pump the blood glucose monitor talks to the insulin pump and you can bolus from that on a screen that you can see. Without needing to be able to touch the insulin pump, which I find particularly handy when I'm out to dinner wearing a dress or the weather is cold and I'm wearing lots of layers. The sets where you insert the needle were similar (and still came in pink). It was of course a different number for me to ring to order supplies, but otherwise not much changed there either so I hope that this slightly helps dispel any 'change over' fears. If you're looking for a more official comparison between the two pump manufacturers, then Medtronic has one on its website which could be helpful.